LAS VEGAS, NV — Just a little over a year ago Acer started selling its original Swift 7 laptop that was thinner than one centimeter, yet packed quite a decent set of hardware. 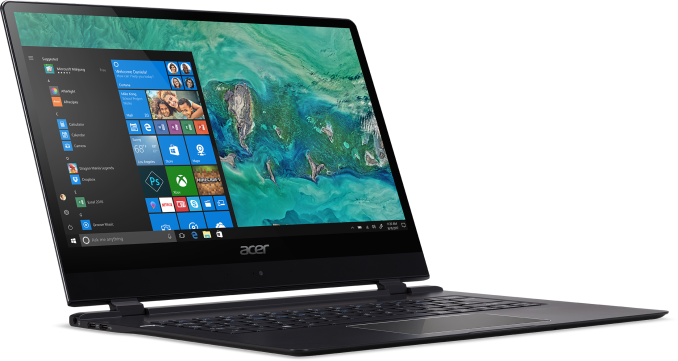 At this year’s CES, Acer is launching the second-generation Swift 7 that is even thinner, yet has a larger display and an integrated 4G/LTE modem from Intel. Meanwhile, the new system is also considerably more expensive than its predecessor. 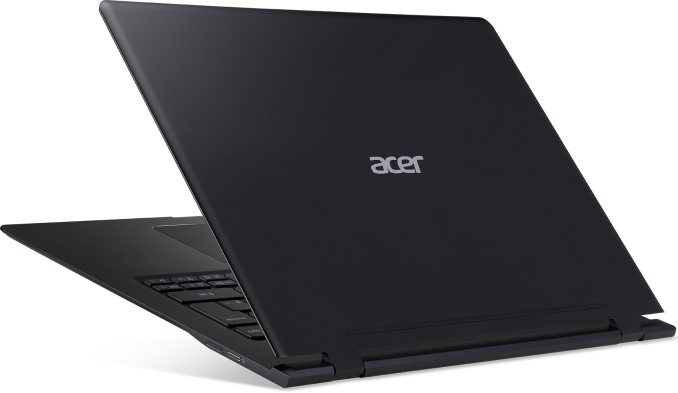 The new Acer Swift 7 (SF714-51T) comes in a brand-new aluminum chassis featuring an 8.98-mm z-height, down from 9.98 mm in case of the 1st Gen Acer Swift. The new design moves two USB Type-C ports and a TRRS connector from the right side to the left removes the fingerprint reader from the touchpad and uses slightly different display hinges. The display itself now measures 14” and judging by its thinner bezels, the laptop itself did not get significantly larger than the original Swift 7 (if at all) that came with a 13.3" LCD. To optimize internal interconnections (perhaps, to install the LTE antenna behind the top display bezel), Acer moved the webcam from the top of the display bezel to its bottom. In general, the all-black matte finish of the new Swift 7 looks very classy and will fit into almost any interior. Moving on inside. Since Intel did not update its Y-series ultra-low-voltage processors last year, the 2nd Gen Acer Swift 7 is based on the 7th Generation dual-core Core i7-7Y75 SoC featuring the Kaby Lake microarchitecture and a 4.5 W TDP. The CPU is accompanied by 8 GB of LPDDR3 memory as well as a 256 GB PCIe SSD (at present it is unclear whether the company plans a 512 GB version). The laptop features a 2×2 802.11ac Wi-Fi + Bluetooth module for local wireless connectivity as well as a 4G/LTE modem from Intel for comms over wider areas. The new Swift 7 comes with an integrated eSIM so users can quickly buy new contracts using Mobile Plans app when they move from country to country. Meanwhile, Acer bundles a 1 GB Transatel data plan that is valid for one month in 48 countries with the laptop to demo capabilities of the system. 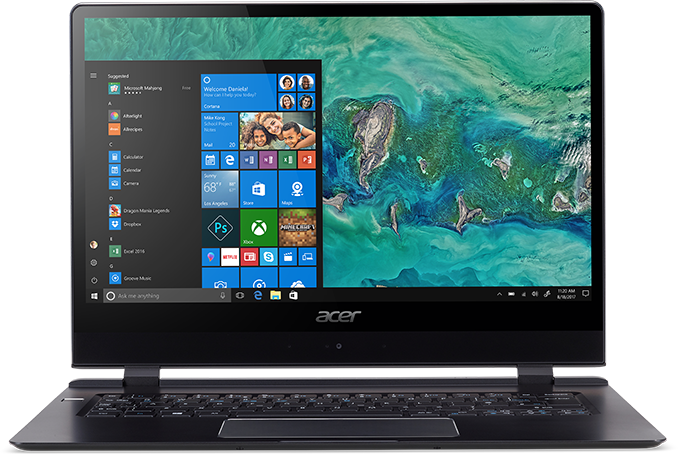 When it comes to battery life, Acer rates the new Swift 7 model to work for up to 10 hours based on the MobileMark 2014 test results, but does not disclose capacity of the battery. The predecessor featured a 9-hour battery life, but back then Acer did not specify conditions or workloads for that number. The new Acer Swift 7 (SF714-51T) will be available in the U.S. and the U.K. this April for $1699 and £1599, respectively. This is significantly higher than the price of the first-generation Acer Swift 7 (based on the Core i7-7Y75 and featuring 8 GB of RAM and 512 GB of storage) even early in the life cycle when it retailed for $1299. At present, such a laptop can be purchased for $1206. Acer naturally justifies the higher price tag with the addition of a bigger display, a 4G modem, and a slightly thinner profile, but the difference may be considered too high by many users (especially because the performance of the systems should close if not equal). On the other hand, the 1st Gen Acer Swift 7 is still available and therefore selling an all-black 4G-enabled Swift 7 at a premium makes sense early in its lifecycle.